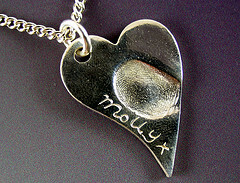 Updating and Repairing Silver Clay Pieces. 1) Make a mechanical bond, like drilling a hole and attaching the new piece by squeezing it on (this then forms it's own little rivet when fired). 2) Or attaching the fired pieces with a special type of paste. It costs about £15 though so I'm going to show you how to make your own version! Lavender oil can be added to silver clay paste to make your own oil paste. Gradually add pure lavender oil drops to a thick PMC or ACS paste mixture (15-30 drops). Stir with a plastic spatula or wooden stick until it binds together. Let it sit overnight to assure complete absorption before using. You can make Lavender Oil with PMC plus, PMC3 and all Art Clay products. When you want a strong bond on fired pieces Oil paste is a must! put them back in the kiln again for 10 mins) that gives them a rougher texture to adhere to. 4) Try not to wiggle the pieces too much as (until they're fired) the bond still isn't as strong as when you use slip on unfired pieces. Fire at the hottest temp your clay and inclusions can stand preferably for at least 2 hrs. Extra Info:Here's a useful article by the PMC guild which shows some strength tests using lavender oil paste. Art Magazine has a making lavender paste video (you have to join but I think it's free). Use the outer foil pack that your clay came in..
Make sure your clay is moist (if not dampen it) then wrap in cling film before putting back into the ziplock packet. Wet a piece of kitchen towel & put into packet with the clingfilm wrapped clay. Ziplock the top shut. (This has kept clay good for days for me & if you keep check the moisture level daily there's no reason it couldn't be longer). A home made option is to get a small airtight container (little lidded pots)and put a piece of wet sponge in the bottom (dense make up sponge type). The moist wrapped clay then goes into the pot and you keep the sponge moist. This way you can have multiple pieces. If you want a good pre-made solution or have larger quantities of clay to store regularly then an American site http://www.pmcsupply.com/ has something called Clay Vaults and Clay Keepers. They are "zip lock" plastic containers with hydrated water crystals inside & they're very good. There are lots of Kilns on the Market suitable for firing Precious Metal Clay. 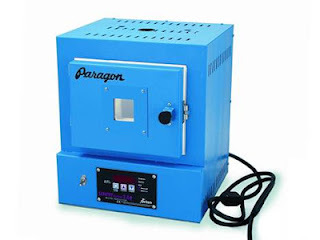 Here is a rundown on three of the most popular ~ the Kitiki Mini-Kiln, the Paragon SC-Series, and the Ultra-Lite kiln. 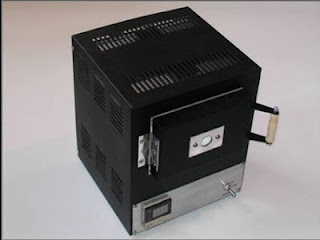 The Kitiki Mini-kiln is a good choice where kiln loads are likely to be small, or where space is an issue. It can be used for general low-budget small-scale work such as Art Clay, PMC, dichroic glass, enamelling, and jewellery. If you are looking to buy a kiln for the first time, the Kitiki Mini-Kiln is a good choice for home, school, craft workshop, jewellery studio, or class. Besides being compact and easy to move, it uses a regular mains socket (no need for expensive re-wiring), it stays cool on the outside, it's controllable, it heats and cools quickly, and it's inexpensive to run. The Mini-Kiln has a Controller, not a Programmer, so there will be some limitations in available firing schedules. e.g. If the target temperature is low, and if the heating rate is set to full, the actual temperature will overshoot before the thermocouple and programmer can regulate it. If the target temperature is high, the overshoot will usually be negligible. While these variations don't affect Art Clay and PMC, they might affect glass, particularly dichroic glass. The Mini-Kiln heats to a lower top temperature – the top temperature of the Mini-Kiln is 1000°C, while the top temperature for the SC-2 is 1095°C. (This should not be an issue for PMC, Art Clay, dichroic glass or enamelling). The Mini-Kiln door opens 90° so, unless the kiln has cooled completely, you should use long tongs in order not to burn your hand taking pieces out. The SC-2 door opens 180°. The Paragon SC series kilns The Paragon SC2 is a good first-kiln, popular with silver clay artists, particularly those also making jewellery with beads, dichroics, enamels, glass, and silver. It's ideal for a studio running jewellery courses: it's compact and easy to move, it can use a regular mains socket, it stays cool on the outside, it's fully programmable, it heats and cools quickly, and it's inexpensive to run. The Paragon SC series kilns come in two versions, as the SC-2 and the 50mm taller SC-3. Each version is made in the following four types: Basic, W with viewing window (shown), B with bead-annealing door, and BW with both door and window. The actual temperature can overshoot before the thermocouple and programmer can regulate it: particularly if the heating rate is set to full. Set to a high temperature, the overshoot will usually be negligible. Work placed at the back of the kiln will be slightly hotter than work at the front. Work near the sides of the kiln will be slightly hotter than work in the middle. If you're using several shelves, work on the top shelf will be slightly cooler. Apart from its internal size, the only minor limitation is that, although 1095°C is hot enough for low-fire ceramics, it's not hot enough for normal ceramics, porcelain, pottery, and stoneware: they need a 1260°C or 1290°C kiln. My UK version SC-2 kiln has a sheathed thermocouple which helps prevent the possible corrosion, and eventual failure, of the bi-metallic tip: usually caused by pollutants produced whilst heating some types of glass. The electronic display prompts for heating rate, target temperature, and hold time, making it easy to set up and re-use accurate drying, heating, holding, and cooling sequences. The UltraLite Kiln heats and cools quickly, but costs very little to run. It's ideal for small-scale work in your home, school, craft workshop, or jewellery studio, or at an arts centre running jewellery courses. The UltraLite Kiln weighs just 1kg, so is easy to take to craft fairs, demonstrations, and exhibitions. If you already have a kiln, you can use an Ultra Lite for drying metal clays, firing single pieces, or quick tests. If you run courses, use several so that more experienced students can optimise their time, rather than wait for the slowest to catch up. The UltraLite is a small, fast-heating, ceramic-fibre kiln, with one embedded heating element in the bottom. Max temp is about 845°C. Putting the lid off-centre will effectively vent the kiln and reduce the temperature but, unless you use a pyrometer, you won't know what that temperature is. 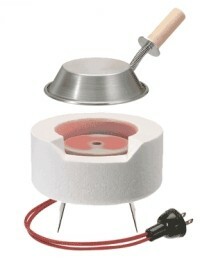 It's ideal for firing Art Clay and PMC using the firing disc insert, and for keum-boo work using the red brass tops. At 845°C you can't over-fire silver clays as silver doesn't melt until about 962°C. You can work with dichroic glasses, enamels, and fused glass, but will need to experiment. Keep a firing log: the material you used, the arrangement of pieces on the shelf, the firing cycle, and the end result. The log is useful if you're learning about colour, materials, temperature, and firing time, and a skilled artist will use the firing characteristics to advantage for different effects. The only minor limitation is that, although 845°C is hot enough for silver metal-clays, it's not hot enough for gold metal-clays, ceramics, porcelain, pottery, and stoneware: they need a 1260°C or 1290°C kiln. The best method I've used was to fire the silver then carefully remove the cool silver without touching the area you are adding gold to (finger oils will affect gold adhesion). Add the gold while the silver is still in it's white stage and then torch fire it on. When Torch firing Torch evenly until the orange glow is present then time the firing for 3-7 minutes (do not overheat or the gold will be absorbed into the surface of the silver...just a light orange glow...not red). I then Finish & Polish the whole pendant by hand, burnishing the gold areas particularly gently. Today I've been asked about drying the pieces you've made before firing. So here are some things you can do to dry your silverclay. Air Drying ~ The easiest way to dry pieces is leave them in a warm room for 24 hours and voila all finished! (Slow air drying is also best for Bronze & Gold clays and repairs filled with paste). Mug Warmer/Hotplate ~ For those of us in a rush, or teaching a class, then a mug warmer or other form of hotplate is great too (AGA & Range oven owners will be grinning now). With these you'll need to keep an eye on the pieces and turn them over every now and again so they dry evenly (or the piece can warp/curl). Food Dehydrator ~ If you've cash to splash a food dehydrator will dry lots of pieces quickly, probably best that you then don't use it for preparing your home made muesli in! The easiest way is using a sharp solid point (like the end of a burnishing tool). You need to wait until the clay is dry (or it kicks up messy edges). Sand & prep the area where the name will go then write your lettering using a soft pencil. Lightly scrape the name onto the clay, support the work well as you do this (so you don't break it). Repeatedly scrape over the same lines building up depth. You'll find a kiddies paintbrush helps remove the dust, which you can keep for making slip. Fire the piece and polish it as normal. Tip: To make the text stand out even more, apply a liver of sulphur patina and then re-polish the piece. It'll save you £££'s against buying one! 4) Fill a selection by clicking and dragging the pointer across the canvas or selection. The larger the drag the more gradual the gradient will be. All of the control of the tool lies in the dragging of the pointer. Pressing and holding the shift key will create perfectly aligned gradients. Ideally, SilverClay needs firing for a set time at a set temperature. However, with practice, you can fire small pieces on a kitchen gas hob. This is best for pieces no bigger than a 50p piece and if you dont have a gas hob you could try a portable camping stove. Lay the mesh on the hob and light the gas. As it heats up you'll notice cherry red areas these will be heating between 650-800 degrees (suitable for silver clay). Turn the gas off and, after the mesh has cooled, lay your dried clay on one of the red spots. Cover the piece with a mesh "box" for firing safety and relight the gas. Allow the work to dry overnight or drive off moisture with a hairdryer, or in a slow oven. Make sure it's completely dry or the work can explode! Torch firing is not recommended for large items and you need good ventilation as you'll be close to the clay when the binder is burning off. 2. Place the work on a soldering block or fire brick, which is in turn set on either a fireproof surface or something you don’t mind being singed (like a piece of plywood). If you are working on the kitchen counter and the piece rolls off the block you don’t want to scar the countertop. 3. Light the torch and hold it so the flame is nearly vertical with the tip of the cone about 3/4" away from the work. Within a minute, the piece will be enveloped in a soft flame as the binder burns away. The flame will soon go out by itself. Within another minute, the piece will start to glow red. Continue heating until this becomes a bright and luminous color. At this point, glance at a clock. 4. Hold this color as uniformly as possible for about 5-7minutes. When the time is up, turn off the torch and allow the piece to cool. If you're not sure it's fully cooled use tongs or tweezers to pick it up and (providing it's not stone set) quench it in water. Most standard handheld torches are rated at 2000F so they can melt silver clay, in an effort to avoid this it's worth doing this experiment so you know what to look for. Pull off a pea-sized bit of your chosen silver clay (PMC or ACS), split it in half, and roll out two small rods. Follow the instructions above with one added step. Concentrate the flame on one of the rods in an effort to melt it. You’ll see a bright mercury-like skin form on the piece and the red color will become even brighter. The edges will start to curl and the metal will be drawn up into a ball. Make a mental note of what you saw. This way you’ll know the signs of melting, and you can withdraw the torch in time before damaging a piece you care about. To complete the experiment, allow the other rod to cool and test it by bending, filing, burnishing, and polishing. This will confirm that, sure enough, torch firing really works! Cutting blade, scalpel - For getting straight edges and making your shapes. Various grades of sanding pads - or get a 4 way nail filing block and strip the sides off. For Hob firing, stainless steel mesh with protection net. Kiln - If you can get access to a kiln then use it, the metal is normally denser and the results more consistant. Stainless steel or brass brush - for brushing off the white post firing and leaving you lovely silver. Silver polish & Cloth - for getting the final buffed up shine. For ring making - A sliding ring guage, A wooden ring mandrel, and ring papers (to stop clay sticking to the mandrel). For Better finishes - A small set of metal files for neatening edges quicker than sanding them down. Burnishers & ultra fine sanding pads - Post firing for a REAL shine! Tiny drill bits - you can twist them in your fingers to drill through the unfired clay & make jump ring holes & hanging points. Texture Mats/plates - Roll the clay out on these and you'll have fabulous patterns straight away! Letter Stamp Set - For stamping words into unfired (rubber stamps) or fired clay (metal stamps).